Warhammer Quest fans, it’s time to celebrate! Warhammer Quest: Blackstone Fortress is set to ship in less than a week! Curious about the new game’s contents, we sent a crack-squad of Squat operatives deep into the twisted depths of the warp and secured an advance copy. Here’s our review of the latest offering from Games Workshop. The box itself is pretty hefty, and arrives packed to the rim with five rules and setting books, a sample chapter of the Blackstone Fortress book, game tiles, markers, dice, and 44 push-fit Citadel miniatures. 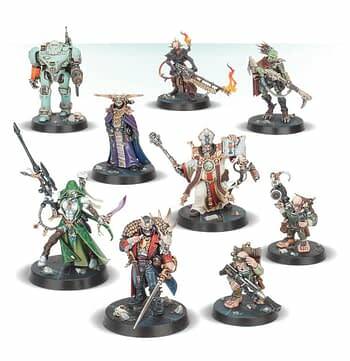 Games Workshop continues to push the edge in miniature quality with these new figures: The minis assemble nicely, with very little flash left over from the molding process. 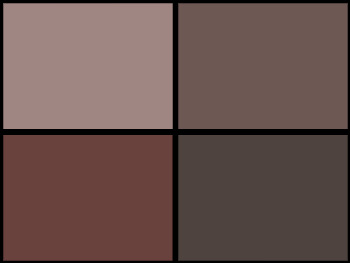 The figures are so good, in fact, that it’s easy to overlook how simple the actual models are! The explorer sprues come loaded with great characters, including a Rogue Trader, a sentient robot, a couple of Xenos operatives, two Ratling agents, and Space Pope. 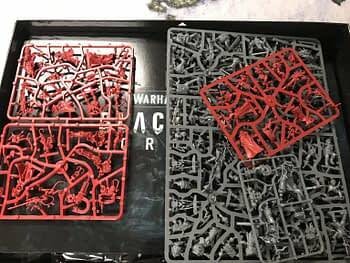 The box also contains a beefy Chaos Space Marine, and two identical sprues of antagonists, including Traitor Guard, Cultists, and Chaos Beastmen for Space Pope to beat up! The miniatures appear to be unique to this game, without any re-issues from any previous Games Workshop releases as far as we could tell, which is a nice touch after all of the previously released models flooding the Kill Team: Champions line. The rule books are printed in slick stock with paper covers, and separated into rules, combat, data-sheet, and after game volumes. Each book is typical with GW releases; easy to navigate, slick layout, and the art is largely, if not completely, unique to this setting. And Space Pope has a page all to himself, Emperor be praised! 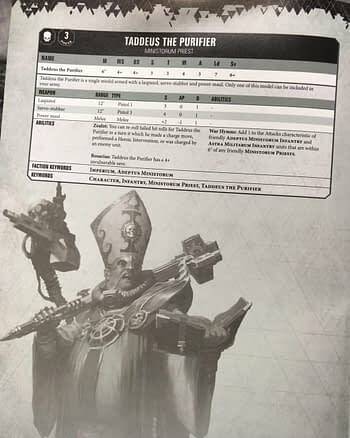 The stat-line for Space Pope tells me Blackstone Fortress characters could plug in to other Games Workshop properties! 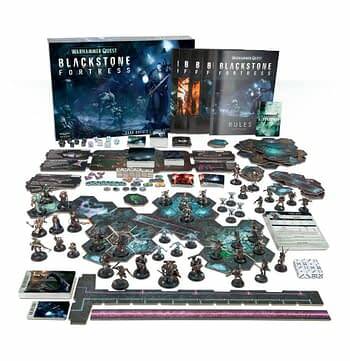 Blackstone Fortress has a pretty hefty price tag on it, clocking in at $150 MSRP. That’s a lot of money for a game, so you understandably want to make sure you’re getting your money’s worth, right? 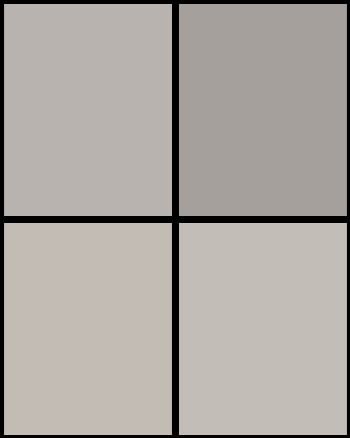 Our opinion is split; if you’re already a Warhammer Quest or Warhammer 40,000 fan, you’re going to be pretty happy. If you aren’t already invested in the lore of the franchise, Warhammer Quest: Blackstone Fortress is still fun, but checking the game out at your local store should help determine whether the game is for you. Warhammer 40,000 players will immediately notice that Blackstone Fortress has a different rules system in place, but it’s pretty intuitive fare, and you should be up and running quickly. 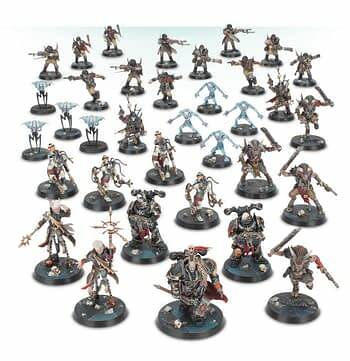 The miniatures are unique, high-quality, and can incorporate into your Kill Team and Warhammer 40,000 games. 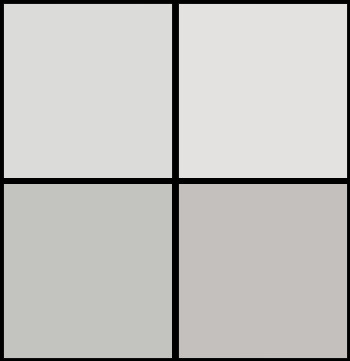 This should increase the box appeal to hard-line war-gamers who aren’t interested in the board game aspect of Blackstone Fortress. Warhammer Quest: Blackstone Fortress can be re-played, as your explorers will generate the game tiles in play as you start each unique session. The rules state that the game is playable for 1 to 5 players; we weren’t able to try the solo game rules as of this writing, but co-op play was a lot of fun! There is a pretty solid how-to-play video with Becca Scott at Games Workshop’s website, check it out! Warhammer Quest: Blackstone Fortress ships on November 23rd, and lands with an MSRP of $150. Ensure your copy by pre-ordering at your local gaming store or Games Workshop stockist today!